Bharat Gas has launched an SMS service by which customers can get their LPG information by sending a simple SMS through their registered mobile. 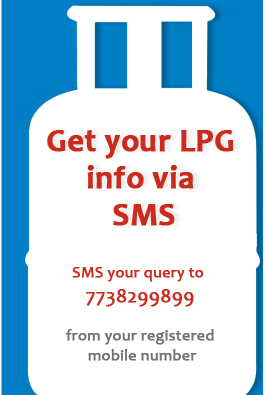 Send an SMS by typing LPGID to the number 7738 299 899 by your registered mobile number to get your bharat gas LPG ID. Send an SMS by typing LPGQUOTA to number 7738 299 899 to get the information about consumed subsidized cylinder. Send an SMS to the number 7738 299 899 by typing LPGSUBSIDY from your registered mobile number. Send an SMS to the number 7738 299 899 by typing DBTLSTATUS from your registered mobile number for getting LPG subsidy details.